Earlier this month Epson America Inc. announced the new line of color laser all-in-one printers for SOHO segment (small office / home office). The new WorkForce 2600 series are represented by three models: the WF-2630, WF-2650 and WF-2660. All of them differ in price and number of functions. All of the new models provide broad connectivity options for comfortable mobile printing and are equipped with Epson Connect, which allows to scan and print documents, E-mails, images and photos as well as web-pages from tablets and smartphones. Wi-Fi and Wireless Direct printing are also available. 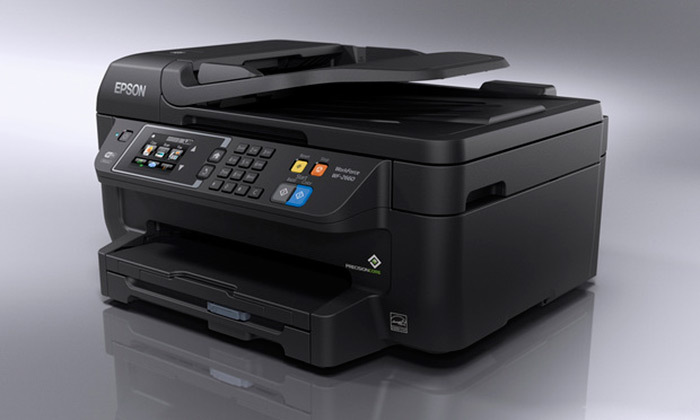 The WorkForce WF-2630 features ISO print speed of 9 ppm in B/W and 4,5 ppm in color, 100-sheet paper input capacity, fax capabilities direct from a printer. It will be available this month under $100. The WF-2650 uses Epson’s Precision Core printhead technology, providing high quality output, a 2.2-inch mono-graphic display. Is available this month under a price of $130. Both with the WF-2660 they feature 150-sheet paper input capacity, duplex printing and ISO print speed of 13 ppm in B/W and 7,3 ppm in color. The WF-2660 supports NFC (Near Field Communication) touch-to-print, uses Epson’s Precision Core printhead technology, is equipped with a 2.7-inch color display. All this priced under $150 (available in October). This entry was posted on Wednesday, September 10th, 2014 at 1:19 am	and is filed under Epson, laser, printer. "New HP All-in-Ones For Different Types Of Demands"
"Fuji Xerox “Robot”-Printer Brings Documents Right To Your Hands"